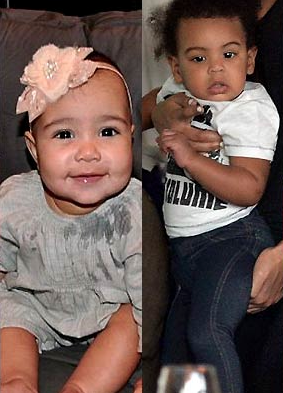 North West and Blue Ivy scheduled for a play date during the KimYe wedding weekend extravaganza. Now, a source close to the big event has informed HollywoodLife.com EXCLUSIVELY that Kim and Kanye’s daughter North will have a special companion on their big day. “It’s a family affair, and Kanye considers Jay Z and Beyonce and Blue his family so she’s coming too,” our source continued. How cute! North and Blue are destined to be BFF’s considering how close Kanye and Jay are, so it seems like the girls are off to a great start already. Hollywood Life must be on PMK payroll so until Beyonce/Jay confirms with actual receipts demonstrating true interaction.